Even after they have been made and sold, these pieces will continue to speak to and engage within the many moments that will be shared around a kitchen table. The stoneware is smooth and ageless, yet nonetheless raw and robust. Most importantly, it is functional. This pottery is designed to be used often, and to even become a staple in your household. Hannah Slade is the woman behind the brand. She founded Speck and Stone in 2014, and has been busy behind the wheel ever since. She has always been inspired by earth’s natural elements, raw materials that can be morphed and fired into something of everyday use. “I think that’s pretty special,” she says. Her craft is very literally earth-to-table. Hannah says that “the wheel’s the dream—it’s what everyone falls in love with.” Watching her work is an art-form in and of itself; the rhythmic motion of the wheel and hand is both mesmerizing and beautiful. Her studio is located in The Cotton Factory in downtown Hamilton. Each morning, it floods with sunlight that pours in through the large windows. She begins working at the crack of dawn, but she says her best work happens late at night. (I’m sure that many of us can relate!) We popped by her studio to talk about her love for the craft and her newfound love for Hamilton. What were you doing before you launched Speck and Stone in 2014? I was working as a Registered Nutritionist at a holistic health centre and was also attending the Toronto Conservatory of Music for music composition (which really was, and still is, my life's true love, but an unrealistic successful career for me and I knew that). It was during this time that, just for fun, I decided to take a pottery course with potter Ann Randeraad. I was fortunate that there were only three people enrolled in the class. This meant I received a lot of one-on-one attention and I think that with Ann’s teaching style this period of time was essential in sparking the real – and naïve – confidence that it was something I could maybe actually be good at. I dove in with an innocence and naivety, but I'm grateful for that. Trying something like pottery that I felt an instant kin with and that also challenged me was never a difficult decision to keep plugging away at it, or at least seeing how far I could take it. I quit my nutritionist life in 2012 and got a coffee shop job down the road from my home. I am grateful that I found a couple of really kind and experienced potters that took me under and let me use their kilns and gave me some tips and secrets of the trade. I probably wouldn't have made it this far if it wasn't for their openness. When it came to deciding to launch Speck and Stone in 2014, I was fortunate that it really did all come together fairly easily and with little overhead thanks to a talented husband and friends helping me out. I decided not to go to school for ceramics because I knew, for me personally, if I was willing to hustle and deal with some humbling times I could build Speck and Stone over time with or without schooling. 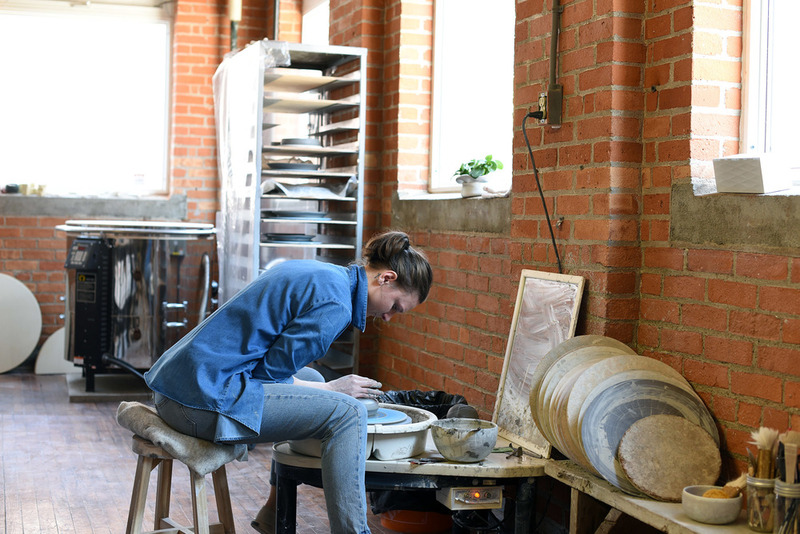 Do you remember the moment you knew you could make a living making pottery? To be honest, some days I still have my doubts on how much of "a living" I can make. I definitely have big hopes and long term desires for Speck and Stone, but I'm also at the point of contentment with what I do and that no matter what happens with the business, the industry or within myself, I know that I will always have a sustainable love and curiosity for my craft. I can see myself running a large ceramic production facility one day, but I can also see myself alone with just my wheel and mud in a back shed somewhere growing old and making things for myself. I would be happy in either scenario…or, ideally, both wouldn't be too shabby. What's so special about pottery rather than another art-form? I'm not entirely familiar with the insides of all other art forms in particular, but I can say that pottery is interesting in the range of possibilities it provides and caters to. It's infinite. It really is an art form and lifestyle that needs a lifetime to get to know it. I was recently chatting with a well-known potter from here, in Ontario, and she told me that she has been in the industry for over 20 years and just now feel like she understands it. Hearing that made me so happy, yet so sad. I do, however, feel honoured and proud to know a minute amount about it; there are a countless different methods and perspectives on the craft and I'm sure my own story will evolve quickly and vastly. As a potter, what are some of your greatest challenges? Oh boy. Goood question. I would say my greatest challenge has always been defining and navigating the business side of things. I've tried for a long time to find the right line between Speck and Stone being a business that sells a product and also being my chosen art form. Even though each piece is made with my two hands and look to it, I do understand that having consistency is somewhat necessary when making functional ware. Trying to reconcile these two contradictory needs and wants of small batch pottery is a battle, although, I think I'm slowly settling into some sort of resolve with it. (Or, perhaps, I'm just accepting that it is what it is as long as it is pleasing for others and myself.) I am always making new and varying pieces, but I have rarely veered from my instinctual aesthetic or glaze pallet for the shop. I'm at a good place right now where I finally understand firstly, what I am physically able to produce within the hours of day and secondly, understanding that sometimes with ceramics it is just impossible to replicate the exact same outcome more than once. I have come to know that this is truly part of the beauty and awe-inspiring thing about pottery and as long as people continue to enjoy and want my work I’m a happy camper! What about accomplishments? Anything you’re most proud of? I'm proud to have learned what I have learned and I am honoured to have a very little toe in the ceramic world. Every time I open the kiln door and see things in one piece that are interesting and pleasing to my eye, I feel over the moon. There are so many things that can (and do) go wrong with making pottery that you learn to find great joy in the little things and gain respect for the process. I would, also say that having pieces in people’s homes and hands still blows my mind and I think that is my favourite thing. I keep things fresh by having bi-annual life crisis's where I freak out, shut down and doubt everything past and future! (Doesn't everyone have these?) I'm being a little dramatic, but it's also the truth. These times make me rethink, and refocus everything that I do have. As soon as I feel like I'm not making good work or enjoying my work, my first instinct is to leave it and get out of that space physically and mentally. Aside from escaping, which obviously isn't always possible or realistic, I am always trying new things and reading and researching methods and materials that I can introduce or even simply familiarize myself with. The world of pottery is such an infinite learning opportunity I usually find new knowledge keeps me curious and fascinated enough to stay in love with the craft. My super savvy and wise husband also plays a huge role in listening patiently to my illogical feelings or expectations. He always manages to whip me into a good place again with some fresh outside perspective and encouragement. You moved to Hamilton fairly recently. What are some of your favourite spots? I'm still definitely getting to know Hamilton and I'm sure I'm missing out on some good places, but I still really like that feeling of exploring and being half a stranger. I moved here in November and instantly my favourite spot to hunker down on a cold night is Work on James Street North. It’s walking distance from my house and I really like the laid back, mix match, vibe there. AND the fact that there is kimchi on nearly every dish! But since the heat and sun has landed, finding any sort of patio is the priority. The Ship on Augusta St. has become a staple for us, and you can't really beat the smoked hickory "machete" cocktail or tacos at Mezcal. I like going for walks around Bayfront Park or driving around Dundas and the escarpment area house hunting. I usually grab coffee on the way to work from either Small's, Vintage Coffee or the Cannon. Where can we find you on a day off? On my days off you can find me, firstly and most importantly, sleeping in! I only recently started booking off my weekends and nights and it has been really nice. My days off vary, but ideally it would be left wide open with zero things on the calendar and open for spontaneity. Hannah ships her stoneware internationally. She does admit she is still amazed that her pottery can be found in kitchens all over the world—perhaps dishing up a bowl of borscht soup or alternatively, a plate of tacos. For more info, head on over to speckandstone.com or check out her Instagram.